Ever laid back and daydreamed about having your own magic show? A theatre with your name in lights? Keith Fields did. More than that, he did something about it. 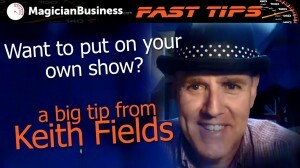 Keith Fields has appeared in New York’s Broadway, London’s West End and the Las Vegas Strip, but not in his own show, doing it his way. Keith’s new show “A Brit Of Magic” is a multimedia extravaganza of comedy and magic that plays at the Iris Theater in the tourist town of Gaitlinburg, Tennessee. This show exists because Keith had the drive and persistence to make it happen. Find out what busking taught Keith about business? Do you devise a show and try to find a venue or do you find a venue that needs a show? Is one of these better? How do you pitch your show idea? Do YOU need to have the business plan worked out in advance for the theatre? Who decides of the length of the ‘run’ of the show? Who decides on ticket cost? Who is responsible for drawing up a contract? Are there any advantages to playing outside your native country? Can you do back of room sales? Please help by leaving a review on iTunes, they are really helpful and we appreciate you taking the time. Reviews help our podcast get noticed by entertainers, magicians and performing artists all over the world which grows our community. A larger community means more experience to share with each other so please feel free to share your comments below.